PanARMENIAN.Net - In Canada since October 17, marijuana is legal to be purchased by anyone and not with doctor’s prescription but with the aim of relaxation. The first stores to start the sale of marijuana have special license and are located in the province of Newfoundland and Labrador. 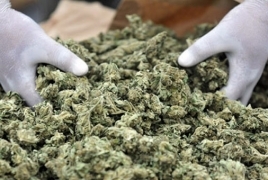 It was also stated that people wishing to purchase marijuana were waiting for the start of the sale since 20:00 local time till midnight, reports InterFAX referring to CBC TV channel. Since October 17, usage and purchase of marijuana for relaxation (meaning consuming psychoactive substances without prescription, for pleasure or other reasons) is legal. Appropriate law was approved in summer of 2018. According to the law, inhabitants of Canada have the right to purchase and keep maximum 30g of marijuana without any reference or prescription. Canadians are now also allowed to grow the appropriate plant in their houses however no more than 4 bushes. Sale of marijuana to individuals under 18 is prohibited. Canadian government had made the use of Marijuana for medical reasons legal back in 2001. As of now consuming marijuana for relaxation is legal in 9 states of the US as well as in Colombia Federal District. However the laws of 4 other states prohibit any use of narcotic plants.